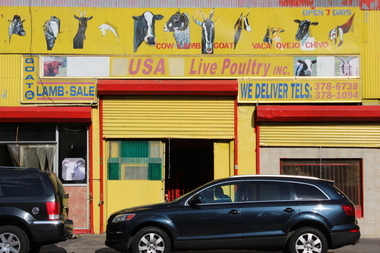 A Bronx youth center is trying to get a nearby slaughterhouse to move. MORRISANIA — A South Bronx youth group is fighting to relocate a nearby slaughterhouse that members say is putting the neighborhood's health at risk. However, the owner's son counters that their business, USA Slaughterhouse located at 168th Street and Third Avenue, has been in the neighborhood for decades and that they run a clean, reputable shop. The Renaissance Youth Center, which has been at located across the street for five years, has had issues with the business for a long time, said the center's leader Bervin Harris. "I guess now we've had enough," he said. In a letter that the center's youth council wrote to the slaughterhouse, members stress that they do not want to attack the business and recognize that it performs a valuable service for families in the neighborhood, but they maintain that some of the business's practices are putting people's health at risk. "Passersby face puddles of animal blood on the sidewalk, harsh odors from animal feces, exposure to improperly disposed chicken carcasses and at times direct contact with improperly enclosed livestock," the letter reads. It asks the business to fix a hole in the gate on the Third Avenue side of the building, properly dispose of its animal carcasses, have bio-waste picked up early in the morning or late at night, immediately clean up any animal waste or fluids that spill onto the sidewalk and improve the ventilation of animal odors. "When they have their waste pickup, that's when the smell becomes really egregious," said Ariel Roland-Waring, a 22-year-old member of the group's youth council, "and you can smell it even blocks away." "We would like the business to be relocated to a different area," she continued. Ibrahim Simreen, son of the slaughterhouse’s owner, said their business had been in the neighborhood for more than 20 years, and these types of complaints were nothing new. However, he stressed that they run a good business that gets inspected regularly and does not have any major issues with cleanliness. “We make sure we clean up the sidewalks every week,” he said. “The only blood you see, brother, is this right here,” he continued, referring to the inside of the slaughterhouse. Simreen said he did not receive the letter from the Renaissance Youth Center and that if the group had any problems with his business, they could come speak with him directly. "They can just walk across the street and talk to me," he said, "so I don't know what's the issue." Lisa Koumjian, spokeswoman for the state Department of Agriculture and Markets, said the agency is currently investigating issues with the slaughterhouse and had investigated similar complaints about the business in 2013 and 2014. “In both instances, deficiencies were noted and corrected,” she said. Inspectors from the department routinely look at slaughterhouses to ensure they are complying with regulations on food safety and animal health, according to Koumjian. Assemblyman Michael Blake said he has started to look at legislative action that could be taken to address health concerns about slaughterhouses that have come up in The Bronx and in Queens but stressed that he was still at the beginning of this process. "We’re trying to figure out if this is an administrative change or a legislative one, so now that we have the info, we can start trying to figure out what can be done," he said, "but it is a priority of ours to resolve it."